For more than two centuries, Pine has been one of the most commonly used wood species for wood flooring. For more than two centuries, Pine has been one of the most commonly used wood species for wood flooring. Technically, it isn’t even hardwood but some varieties of Pine can be as hard as other species of hardwood, and it is highly durable. Since Pine trees mature relatively quickly, it is an ideal choice for flooring. It also has a natural grain pattern that looks nice with many different stains. Here are some cool facts about pine hardwood flooring! Pretty much anywhere you go in the Northern Hemisphere, you can see Pine trees growing wild. They mature relatively quickly (for trees) and can live for over a thousand years. There is a super old Bristlecone Pine known as Methuselah that is thought to be more than 4,500 years old! The vast majority of domestic commercial Pine is harvested from Yellow Pines. These trees are generally very tall and have few low branches. Pine lumber has been used for everything from framing and flooring homes to building wooden roller coasters. Back in the time when the US was still The Colonies, Pine was coveted by the British Monarchy to be used in shipbuilding. The needles of Pine trees can be used to weave baskets, and some varieties produce edible seeds called pine nuts. Pine nuts are quite nutritious and used in a variety of delicious culinary concoctions! 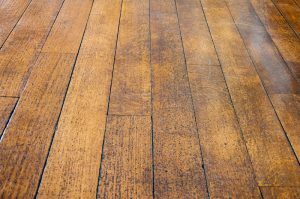 There are two main varieties of Pine used to create hardwood flooring: Southern Yellow Pine and Heart Pine. Southern Yellow Pine: The color of Southern Yellow Pine ranges from a light yellow or yellowish-brown, to a pale yellow or beige sapwood. Depending on how the boards are cut, it can either have many character markings or very few. This makes it perfect for a variety of settings. Heart Pine: Heart Pine is taken from the heartwood of the Pine tree, which makes it darker in color than other varieties of Pine flooring. When it is first laid down, Heart Pine will probably have a yellowish hue. As it ages, it will mature and darken and you will see that warm brown color that hardwood flooring lovers everywhere look for. This entry was posted on Friday, March 2nd, 2018 at 2:19 pm. Both comments and pings are currently closed.